Is There Any Defense For Ilhan Omar? Ever since she burst onto the national political scene by winning election to the House of Representatives in November, Rep. Ilhan Omar (D-Minn.) has presented a challenge to her party. 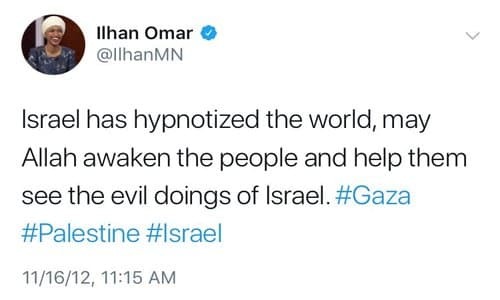 Like her fellow freshman Rep. Rashida Tlaib of Michigan, Omar is a supporter of the BDS movement and a fervent opponent of Israel. But Omar has not been content to stick to critiques of Israel's government or even to efforts to promote boycotts of the only Jewish state on the planet. Instead, she has broadened her attacks to include supporters of Israel--both Jewish and non-Jewish, including fellow members of Congress--and stooped to using traditional anti-Semitic tropes about Jews buying power and manipulating the United States, as well as accusing Israel's supporters of dual loyalty. This has outraged many Democrats, who rightly think that Omar means what she says when she denounces supporters of Israel as having been bought or are demonstrating dual loyalty. As a result, once again House Democrats are preparing a resolution on anti-Semitism that will attack the hate, but apparently leave out the name of the hater. And there's no sign that House Speaker Nancy Pelosi will strip the congresswoman of her coveted seat on the House Foreign Affairs Committee or do anything other than issue a slap on the wrist for her anti-Semitic recidivism. Pelosi thought she had fixed this problem last month by forcing Omar to apologize for a previous anti-Semitic outburst. But by once again flaunting her predilection for hate publicly, Omar, who shared the cover of this month's issue of Rolling Stone magazine with Pelosi and fellow young Democrat rock star Rep. Alexandria Ocasio-Cortez, sent a signal that she has no fear of her party's leadership. One of the reasons for this is that many on the left are rising to her defense. What possible defense can there be for a member of Congress who traffics in anti-Semitism? The answer is that the left wing of the Democrats seems to have succumbed to an epidemic of whataboutism. By that I mean their response is to try and deflect attention away from her by pointing out other examples of people behaving badly and to say that Omar shouldn't be treated any worse than them. The chief exponent of this line of argument is Ocasio-Cortez, who broke her silence concerning Omar on Tuesday by claiming that Democratic leaders are "hypocrites" for criticizing her friend. This is significant because while AOC has been closely identified as a friend and ally of both Omar and fellow BDS supporter Rep. Rashida Tlaib (D-Mich.), the "Green New Deal" advocate had thus far avoided getting involved in their attacks on Israel and Jews. AOC said nothing to register her disagreement with Omar's slurs. But she did think it was unfair for Omar to be rebuked when others have not been, even though the GOP at long last did punish Rep. Steve King (R-Iowa) for flirting with white supremacy by taking away his committee assignments. AOC cited an instance in which one Republican shouted "Go back to Puerto Rico" at Democrats during a debate over the government shutdown. That sounds terrible, but the context was the fact that the Democratic caucus had vacationed in Puerto Rico for a conference during the crisis, rather than staying in Washington and negotiate with U.S. President Donald Trump, who eventually folded on his insistence on a border wall. While the Republican who said it apologized, it was a partisan taunt, not an anti-Hispanic slur. Nevertheless, AOC also retweeted a rant in which one Omar supporter said that Republicans had "kidnapped babies from breastfeeding mothers. They've stolen health care from the sick to enrich oligarchs. They pollute our air and water." Compared to these outrages, AOC thought what Omar had said about Jews and Israel was no big deal. But even if you share her views about immigration policy, health care and global warming, this kind of attack on Trump and the Republicans treats a willingness to disagree with Democrats as proof of evil, not merely a difference of opinion. Ironically, that kind of demonization of foes is exactly what Democrats accuse Trump of doing. But in essence, what Ocasio-Cortez is saying is that since she thinks Republicans aren't merely wrong, but bad, that gives Omar a license to slime Jews. Yet even when there are concrete examples of vile attacks on Omar, such as the effort by some West Virginia Republicans to connect her to the 9/11 attacks, that doesn't serve as an excuse for Omar, who is spreading hate from the bully pulpit she occupies on Capitol Hill. More substantive defenses of Omar have come from left-wing Jews like writer Peter Beinart, who has written in The Forward claiming that her support of BDS isn't anti-Semitic. Beinart thinks that it's possible to want to deny to the Jews the right to sovereignty in their homeland within any borders without demonstrating prejudice against Jews. Contrary to his argument, that's false since the worldwide movement to deprive Jews of their rights isn't comparable to the opposition to any other national movement and is rooted in ancient hate. But the salient point about Omar is that she is living proof that Beinart's lame justification of Israel's opponents is willfully blind. Everywhere BDS and anti-Zionism sprouts, acts of anti-Semitism always follow. Since Omar can't seem to oppose Israel without engaging in hate, it shows that the link between anti-Zionism and anti-Semitism isn't purely theoretical, but an unavoidable truth. While neither party is completely free from fault, the Democrats' Omar problem is based in their willingness not merely to tolerate, but to embrace and celebrate the election of two supporters of the anti-Semitic BDS movement in Omar and Tlaib. Given their hateful beliefs, it can't be considered a surprise that they have sought to demonize Jews and supporters of Israel. Much as they would rather avoid it--and deflect the discussion to what they don't like about Trump and the GOP--there's no escaping the fact that Democrats must repudiate and punish Omar if they want to have clean hands with respect to hate.